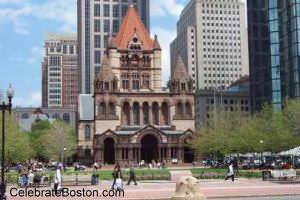 "Trinity Church (Episcopal) is located in Copley Square. The building can be considered the finest church edifice in New England, if not in the country. It is of pure French Romanesque style, in the shape of a Latin cross, with a semi-circular apse [cavity] added to the eastern arm. The clear-story of Trinity Church is carried by an arcade [series of columns] of only two arches. Above the aisles, a gallery is carried across the arches, which is called the triforium gallery. This serves to connect the three main galleries, one across either transept [intersection where cross meets], and one across the west end of the nave [main area of the church]. The extreme width across the transepts is 121 feet, and the extreme length 100 feet. The chancel is 57 feet deep and 52 feet wide. A unique chapel connects with the main structure by an open cloister [covered walkway], the effect of which is very striking. The whole interior of the church is finished in black walnut, and the vestibule in ash and oak. The interior decorations are elaborate and in exquisite taste, and they form an enduring monument to the skill of John La Farge of New York. A great central tower, 211 feet high, surmounts the structure, rising from four piers at the crossing of the nave and transept. It is massive in form, and is the main feature of the edifice. The tower inside is 46 feet square. The material employed in the body of the church is Dedham granite, ornamented with brownstone trimmings. The exterior of the apse is decorated with mosaic work of polished granite. The church has several stained glass memorial windows, made in Europe. It resembles some of those cathedrals in the South of France which are recognized as models in a noble school of ecclesiastical art. The architects were Messrs. [plural of Mr.] Gambrill of New York and H. H. Richardson of Boston. The church was consecrated on February 9th 1877, the bishop of the diocese conducting the services. Four prelates of the church, many clergymen, the governor of the State, the mayor of the city, and a large number of other people of distinction were present on the occasion. The history of Trinity Church begins in 1728. The movement developed slowly; and it was 6 years before the cornerstone of the proposed building was laid, though the church was organized under the name of Trinity Church, and services begun elsewhere. On April 15th 1734, sufficient subscriptions were then secured, and the cornerstone was laid by Reverend Roger Price of King's Chapel as commissary of the Bishop of London. The building was erected without further delay, and on August 15th 1735, had opened for worship. It was a wooden structure, 90 by 50 feet, and 30 feet stud. It was a plain affair, with gambrel roof, standing with its end to the street. In 1828, this building was taken down, and on September 17th of that year the cornerstone was laid for the second church building. The features of the latter were its massive walls and its stately tower. It was a solid Gothic structure, and intended to reproduce the Old English type of Episcopal temple. It was destroyed in the Great Fire of 1872, and its broken tower and partly crumbled massive walls formed a most picturesque ruin after the havoc of the flames. Coincidentally, in the winter preceding this disaster, the parish had referred the subject of a new church building to a building committee, and eventually the designs of the architects for the church now standing were accepted. The new Trinity was then built and completed in the winter of 1877. Copley Square is considered the bustling center of the Back Bay District. Nearby attractions include Copley Place, the Newbury Street shopping area, Prudential Center, and Hynes Convention Center.